The town of Hamden is home to around 61,000 people, but during the school year, Quinnipiac University adds about 10,000 more to the population of Hamden. Many of the vehicles owned by Quinnipiac students are registered out of state, causing Hamden to take a loss on motor vehicle taxes. Connecticut Conference of Municipalities has noticed that many out-of-state vehicles are not registered within towns and has been a problem throughout the state. Towns such as Waterbury, Bridgeport, Danbury, New Haven and Stafford have also tried contacting companies to help track down tax invaders. A study done by the city of Waterbury in 2016 uncovered more than 4,000 vehicles registered out of the city. The study estimated that the cost of those lost registrations approached nearly $450,000. Chief Assessor, John Gelati, said the tax is being put in effect to have equalization in the town of Hamden and it will include students who live off campus and drive cars with out-of-state plates. “This is a part of a comprehensive revenue initiative that we are launching which includes an audit of personal property and real estate as well,” said Gelati. Gelati said the tax will not affect any specific motor vehicles in particular, regarding students in the Quinnipiac community, it requires notification to the vehicles insurance. Gelati said that the process would be much easier if everyone contacts their vehicle insurance company to register their car in Hamden. 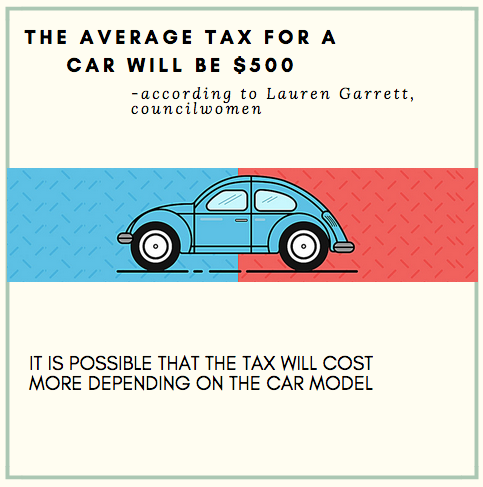 Not only out of state cars will be taxed but students that reside in a different part of Connecticut will also need to register their car with Hamden. If a car is seen in the same area for a couple of months, that car will need to be registered in Hamden. The assessor office will be monitoring theses cars that are out of state and are seen on a lawn or driveway for a few months. “The tax will affect students who reside in Hamden or have moved here after college and have not yet registered their car in the town,” said Gelati. Depending on how long the car stays in Hamden will determine whether or not the car needs to be registered. Those who are here for a visit will not be taxed but for students living in off-campus housing, this may create a problem. The town and assessor’s office have an obligation to discover taxable property in the town. They are allowed to scan license plates over a period of time if they suspect a person to be living in Hamden with an unregistered vehicle. Gelati said that he has received positive feedback from residents of Hamden and believes that this might even bridge the gap of Quinnipiac students and Hamden residents. He believes that it is a positive move for the university and the students to be in compliance and pay their appropriate taxes. Gelati is not sure how this would affect on-campus residents because Quinnipiac is private property but he is sure that students living in off-campus housing will be affected. “I would like to add that, should the university students want to have more information about this process we would be more than happy to attend a meeting and help students learn more about the process to register their cars in Hamden,” said Gelati. Gelati understands that the process of registering a car can be quite intimidating and is happy to speak with the school and students to makes the process easier for all.